I am not being compensated for writing this post. This is based on my own experience and opinion. One of my absolute favorite restaurants in the French Quarter is Ralph Brennan’s Red Fish Grill. It is near the Canal Street end of Bourbon Street. Casual seafood dining at its finest. Hubby and I go there often when in the Quarter, take visiting friends and family, and recommend it whenever asked where to eat. Red Fish Grill is known for several signature dishes. 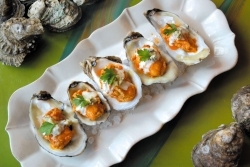 BBQ Oysters…You can order these as part of their sampler appetizer dish, by the dozen, or on a Po-Boy (winner of Best Seafood Po-Boy at Po-Boy Festival). 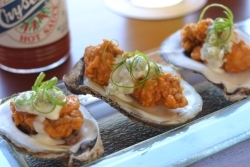 They are buffalo style oysters made with Louisiana’s own Crystal Hot Sauce and topped with a specially made blue cheese dressing. Delish! I like to get a 1/2 dozen of them and then a 1/2 dozen raw oysters on the half shell. Hickory Grilled Redfish…topped with sauteed LA jumbo lump crabmeat and lemon butter sauce. Served with wild mushrooms and Pontalba potatoes. One of my faves! Double Chocolate Bread Pudding…I hardly ever order dessert when eating out. And I am not a big fan of bread pudding, but THIS is in a league all its own. Not your traditional bread pudding. So phenomenal it must be ordered 20 minutes in advance. It’s like a dark and semisweet chocolate brownie topped with chocolate almond bark. After it arrives at your table, the server pours white and dark chocolate ganache on top of it. Heavenly. Red Fish Grill is a nice laid back environment. When Hubby and I just want raw oysters on the half shell, we sit in the oyster bar area. There are some cool, large oyster and pearl mirrors over the bar. You can also watch as your oysters are shucked and placed on your platter. Add horseradish, lemon juice, cocktail sauce, hot sauce and I’m good! There are additional dining rooms as well and a wine room for private parties. During big New Orleans events, it is not uncommon to see a celebrity or two. Hubby and I dined near Malik Yoba, Kid ‘N Play, and a few others once. For more information on this fabulous restaurant and their recipes, visit RedFishGrill.com. Have you ever been to Red Fish Grill? Doesn’t the food look and sound awesome? Are you a seafood lover? If so, what’s your favorite? Sounds like a great place to dine! The bread pudding looks amazing too! You can’t go wrong with anything that you order there. I can’t wait it try this! We love seafood. Maybe I can get so even to order the bread pudding and give me just a taste. I’m trying to keep things off my hips! I hear you about the hips! There is so much to choose from at Red Fish Grill. You’ll love it, Betty. The oyster bar is so cool!! Love the hanging oyster shells and cool alligator chairs! My husband would absolutely LOVE this place!! Unfortunately I'm allergic to seafood…IKR, can.you.believe.it! Lol! My recent post How ugly can you get…my story! Thanks a bunch, Kristin! Yes I'll be back. My family loves seafood, and the chocolate bread pudding looks AMAZING!!! Thanks for sharing at Wine’d Down Wednesday! Pinning your post to our WDW Pinterest board to share with our followers! Hope to see you back at the party next week! My brother's family lives in New Orleans so I have a special place in my heart for this city! Next time we are there I will ask them to take us to this restaurant. That grilled redfish looks amazing! Nice review. Please do. You won't be disappointed. Thanks for stopping by! I love Cajun and Creole food! This looks like an amazing place to visit! I'm a big foodie! Thanks for stopping by, Kathy! It is amazing. They always have great specials for lunch and dinner. LAwd! That food looks delish, Kimberly. A trip to NOLA needs to be in the works for me! It's good stuff. You need to try it. This is making me want to come to you girlie! I can't deal with the temptation of the BBQ Oysters! This place is a must the next time I visit there! I like everything that I've eaten there. Anyone I've taken there or recommended it to thinks the same. I just went on Saturday. Didn't get the bread pudding, but had the BBQ oysters and raw oysters. Hubby had the Wood Grilled Gulf Fish burger, friend of mine had BBQ oyster po-boy, and another friend had sampler with BBQ oysters in lettuce wraps. Everything was delicious! Right on the hips, Dana! No doubt about it. Oooooh we are gonna be in nola on Saturday but that Bread pudding looks like we may have to make a side trip to the Quarter! OMG it looks SO GOOD! I'm a sucker for Bread Pudding! When I was there this past weekend, I watched as they brought it out to someone's table. I daydreamed for a moment. Ahhhh. I've actually never been there, probably because I don't eat that much seafood. (I know, very strange for someone that grew up literally on the Atchafalaya) But that bread pudding looks DIVINE! Oh my goodness. I might have to check that out next time I'm in town. Everything looks amazing. 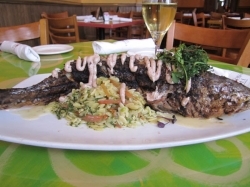 The hickory grilled redfish looks absolutely delish….and I love seafood…I'm boring so fish/crab/lobster are my favs. I've never been to Red Fish but would totally love to visit one day. My recent post Can a 6 year old read too much? There's nothing boring about fish, crab, or lobster. I'll take any one of them.